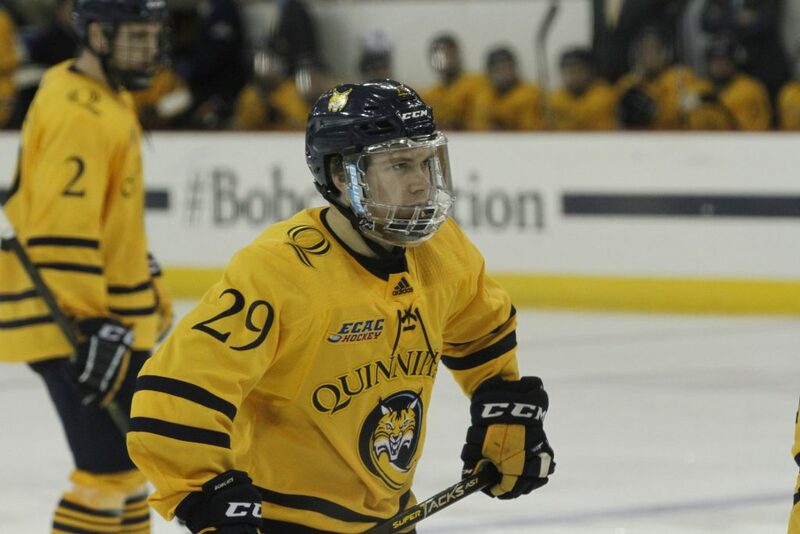 As soon as Quinnipiac’s season ended a season ago – a 2-0 loss to Cornell in the ECAC Quarterfinals – one thing became quite clear; change was imminent. The team had finished 16-18-4, its first sub-.500 finish since 1995, Rand Pecknold’s second season at the helm (when the school was still Division-III). It seems clear now, though, that the change the Bobcats’ needed has indeed arrived. In the process, it has revitalized a program that has constantly chased success. 11-2: How did they get there? This is a loaded question, I’ll admit. There are a lot of reasons why Quinnipiac is currently ranked No. 9 in the country, according to USCHO.com. So, let’s break that down. The Bobcats should be thankful for Odeen Tufto and Chase Priskie. Simply, either of these guys could be considered the Bobcats most important player. Tufto is off to a torrid start after his remarkable freshman campaign, as he has tallied 18 points on nine goals and nine assists in 13 games. His latest highlight came in the form of a hat trick against Maine. Priskie, though, isn’t far behind, as he’s put up 16 points (eight goals, eight assists). They’ve been the leaders of a Bobcat offense that averages 3.77 goals per game, 6th best in the country. The combination of Keith Petruzzelli and Andrew Shortridge. Goaltending wasn’t a concern coming into the season. Rather, it was more of a question of who would see more time. After equally impressive showings from Petruzzelli and Shortridge, Rand Pecknold has a very good problem on his hands. Petruzzelli has elevated his game to the tune of a .913 save % and 2.01 GAA. He’s also collected three shutouts. But, it could be argued that Shortridge has been even better. His numbers through four starts are impressive (.946 save %, 1.25 GAA, one shutout). If both keep it up, it’s not going to matter who Pecknold decides to start. Hats off to Bill Riga, the Bobcats’ recruiting coordinator. His team is reaping the benefits of one of the programs strongest recruiting classes in recent years. Wyatt Bongiovanni and Ethan De Jong (along with Odeen Tufto) have combined to create a very potent top line. Aside from the aforementioned rookies, Sweden-native William Fällström and Vegas Golden Knights draft pick Peter DiLiberatore have produced admirably (three goals, 10 assists). The Bobcats’ have seen increased production from two of their most important defense pieces; Brandon Fortunato and Karlis Cukste. Fortunato, in particular, looks like a different player. He finished last year with eight points. This year, though? He’s tallied 13 assists, the best mark on the team and tied for second best in the country. Cukste, on the other hand, has contributed nine helpers. There’s a reason why the team has continued to climb in the rankings, and it’s quite obvious. They’re winning a lot, and they’re beating some pretty good teams, too. The team defeated Cornell in comeback fashion on the road, 4-2, thanks to three straight goals from Joe O’ Connor, Chase Priskie and Alex Whelan. In ECAC Hockey matchups, Quinnipiac owns a 4-2 record. That’s a great start, but the gauntlet that is conference play will only get tougher as the season goes on. Should we expect some growing pains from a fairly young team? Yes. Should we expect that to slow them down, though? Probably not. The team will certainly be tested in the coming weekends, as it will face No. 19 Princeton and No. 3 UMass. Following this four-game stretch will begin five straight games against conference opponents. Predicting outcomes can be a crapshoot, but one thing is certain; we’ll learn a lot about this team in the next two weeks.